If your property exists in a touristic destination in Dubai, letting it out short term or turning it to a holiday home can increase your chances of a great return on investment. Today a high concentration of holiday accommodation can be found in Dubai Marina, Palm Jumeirah, Dubai International Financial Centre and Downtown Dubai, mainly due to their proximity to the port and airport, public transport connectivity (Metro, tram, bus, taxi), tourist attractions, entertainment venues, beach access, and major retail malls. According to a research by Valustrat, there is a generous supply of one-bedroom units, which include boutique condos on the Dubai Marina, within walking distance to the beach, or a luxury loft apartment on a high floor with sea views ranging from Dh300 to Dh400 per night. Luxury two-bedroom units with Marina views and short walking distance to the beach are on offer between Dh400 and Dh680 per night, while luxury family three-bedroom units range from Dh700-Dh1,000 per night. Advertised listings for one-bedroom units in Downtown in close proximity to Dubai Mall and the Burj Khalifa reflect rates of between Dh300 and Dh600 per night for a luxury unit; two-bedroom units with a full fountain view are on offer from Dh800 to Dh1,500 per night with 734 active rentals in Downtown. Cheryl McAdam, director of residential valuation at ValuStrat, says that in the fourth quarter the top source markets for Dubai visitors, which accounted for more than a 50 per cent share, are from three regions: Western Europe (21 per cent), South Asia (17 per cent) and the GCC (18 per cent). Tourists from China ranked fourth among the top source markets with an annual growth rate of 12 per cent. Tourists from Russia (ranked seventh) had the highest annual growth rate of 49 per cent, followed by Nigeria (ranked 17th) at 34 per cent. If anyone has a property that is close to a tourist attraction or the Metro or a big shopping mall, we would recommend they do a short-term rental. A short-term apartment comes with a full package — furniture, electricity, internet connection — due to which it always generates a higher rental value as compared to annual lease. 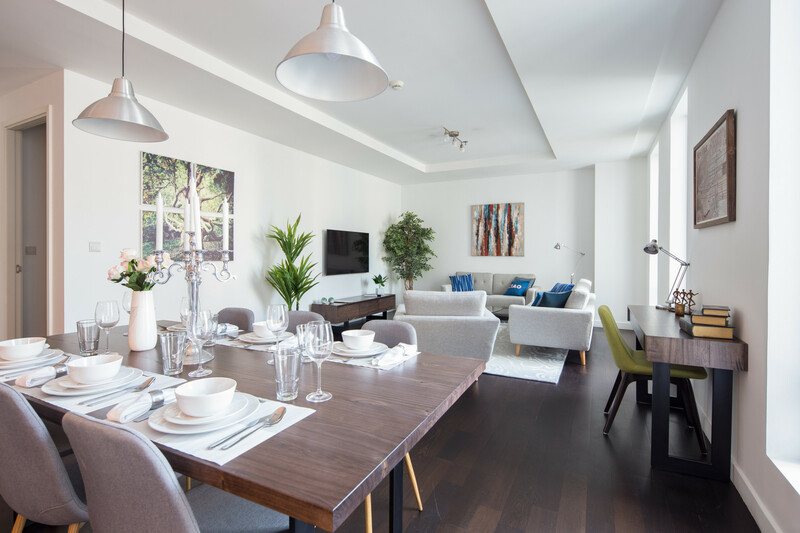 A short-term lease always generates a minimum of 30-35 per cent more returns (depending on location) as compared to long-term traditional renting. Traditionally, short term has only been targeted towards tourists (both leisure and business); however, with recent lifestyle changes, long-term residents and families are also opting for it. In the current market where annual rents are taking an average of seven to eight weeks to lease, the holiday home avenue has come as a big bonus to property owners. On an average, well-run holiday home, operators deliver between 15 per cent and 35 per cent higher returns to the landlords. Returns do vary upon location, views, quality of the unit, etc. Moreover, landlords can use the asset as and when they please, based on bookings in the system. Many overseas investors, who use their units for a few weeks each year, find this of great advantage as the unit is well looked after and generates revenues when they are not using it. Also, the landlords do not need to worry about collecting rents, maintaining the units etc. Every single booking is clocked into the Department of Tourism and Commerce Marketing (DTCM) portal, and the licensed operators find it very easy to approach the regulator in case of any issues they might face. The success regarding occupancy from short-term renting depends on the property itself and in its location. The property will be in demand if located close to the beach, a mall, an iconic building or attraction, transport links, leisure, retail facilities, etc. The summer months can be challenging to generate the kind of occupancy needed, but the rest of the year takes up the slack from the summer. By the nature of the word holiday home, visitors will come to relax and have fun, spend time at the beach, eat and drink in fashionable restaurants and bars, etc., so the closer the property is to all of these facilities the better the investment will be in the longer term.